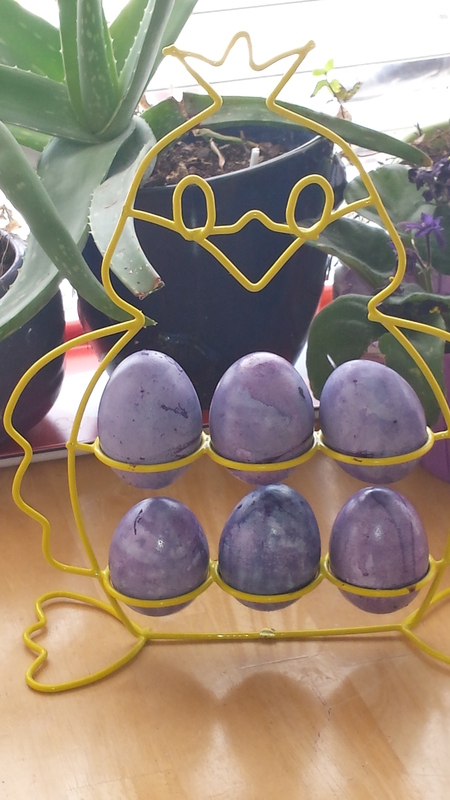 Just love the way my blueberry dyed Easter Eggs turned out. Yes you heard me right, I dyed my Easter Eggs with blueberries. They came out so cool and shiny!! How did I do it? Took some frozen blueberries out of the freezer (maybe a 1/4 cup if that) and placed them in a small bowl. Rolled cooled hard boiled eggs around until I got the effect I wanted – didn’t take long (less than a minute! I am not kidding. Put the egg in the rack to dry. Also did the same thing with beets, but since my beets were found, yes head hung low here, at the back of the refrigerator (and dare I say they were a little wrinkly) those did not dye as well. But it was all in great fun! Here is a closer look. Note: Prior to putting them back in the refrigerator, I did wipe them down with white vinegar later in the day, because they were a little sticky – it is blueberry juice after all. Not as brilliant in color, more deep watercolor effect, but they still looked pretty cool. Thought to impart courage to its bearer, Thyme was given to knights and warriors before they went into battle by ladies of the Middle Ages. During this same period, Thyme was often placed beneath pillows to help promote a peaceful sleep and to ward off nightmares. The ancient Greeks used Thyme in their baths and burned it as an incense in their temples while the Egyptians used it in their embalming rites. Today, Thyme is commonly used as a seasoning, but it also produces a potent essential oil that has cleansing and clarifying effects for the skin; however, due to its high phenol content, Thyme should be diluted with Fractionated Coconut Oil before application. 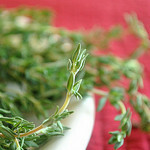 Thyme has specific chemotypes that produce a broad-spectrum activity in promoting winter-time health. Including Thyme essential oil in food dishes or consuming one to two drops a day will promote a healthy immune system when seasonal threats are high. Dilute with Fractionated Coconut Oil then apply to targeted areas on the skin to purify and promote healthy skin. Add 2 drops to veggie capsules and take during winter time to promote immunity. *These statements have not been approved by the Food and Drug Administration. This post is not intended to diagnose, treat, cure or prevent disease. Pregnant or lactating women and persons with known medical conditions should consult a physician prior to the use of any product.